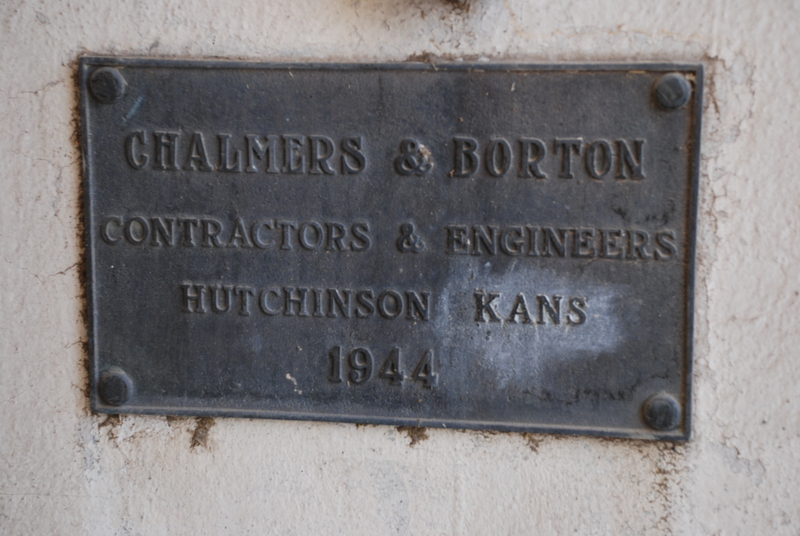 Chalmers and Borton elevator at American Falls, Idaho. 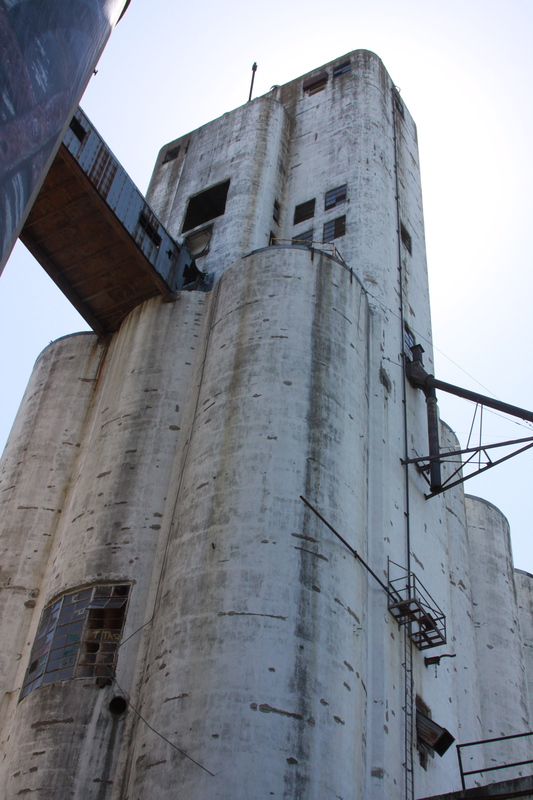 During one of my recent road trips, I came upon a beautiful concrete construction elevator in American Falls, Idaho. It looked much like the stand-alone elevators built by Tillotson Construction of Omaha, with an added annex. It is in full operation. I explored the elevator complex from about 7:30 am, and stayed on site as workers reported for their 8:00 am shift. It was a very handsome elevator in the early morning light. In its details it looked like a Tillotson elevator, except for the rectilinear head house, which is not unknown for a Tillotson or Mayer Osborn built elevator, but would be unusual. Greenwood Nebraska’s straight-up elevator by Tillotson Construction of Omaha. 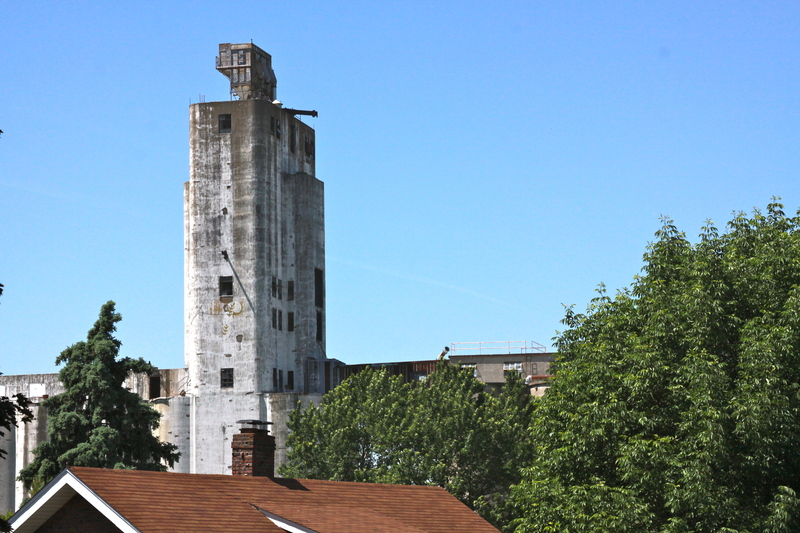 The elevator at Greenwood, Nebraska, built by Tillotson Construction of Omaha, is very reminiscent in its style to the elevator in American Falls. I guess form followed function, and each company offered a product similar in its details–often the deciding factor was the bid price. This Chalmers and Borton elevator certainly faked me out. But it stands as a beautiful example and deserves notice. Looking for the original offices my grandfather used while putting up elevators for a living, I checked maps for the buildings that stood at the old Mayer-Osborn Company addresses. Google gives a bird’s-eye view. The newer address at 5100 York, in Denver, has no building and seems to be a parking lot full of junker cars and abandoned trailers. There is a small white cinderblock-looking building next door that might be that old, but it is nothing to speak of. I am sure the old building where William Osborn and his partner Gene Mayer located their business is long gone. The address at 1717 E. Colfax has a handsome, two-toned, tan-and-brown brick building, three stories high, with a glass-brick corner feature on each floor and a style very like some of the better buildings from the Forties and Fifties. It has white-framed windows. 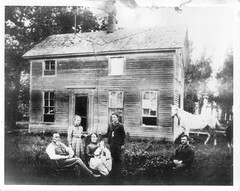 It looks like it could have been newly built, if it was their office back then. A mural painted on the side looks like old Nebraska historical scenes, and a canvas awning shades the entry. If I were any good at all at remembering architectural terminology from my college art history class, you would have a pretty good idea what it looks like just from my description. Alas, there’s no way of knowing from a photo exactly when it was built, and whether Mayer-Osborn set up there in the old office of Holmen and Mayer, but I suspect so. The building would have made a very presentable impression on clients who came in looking for a reputable, established elevator construction company. 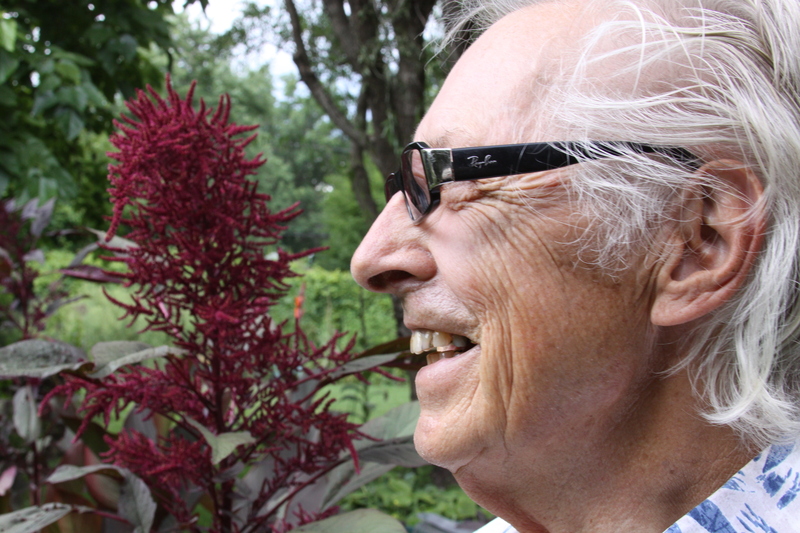 Budd Gauger, who was born in 1930, grew up on a farm fifteen miles from Wauneta, in southwestern Nebraska. He went on to have a career as a newspaperman in Lincoln and Toledo. Here, in his lyrical style, he recalls details from his trips to the old Wauneta elevator. 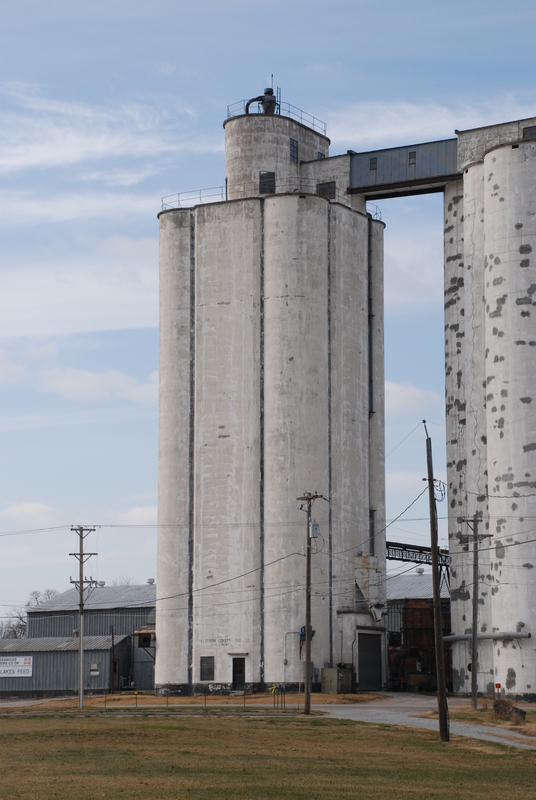 Mayer-Osborn’s plans for a new concrete elevator were approved, in 1949, by Farmers Coop Exchange (FCE), which merged with Frenchman Valley Cooperative in 1990. Fourth of July means fireworks, but wheat farmers examine their fields hoping no fireworks such as lightning destroy their crops. They have decided to start the harvest. I was assigned by my father to drive the big truck, usually a Chevrolet, hauling wheat to elevators in town. I realized that I had down time or wasted time when sitting in the fields waiting to load or at the elevator waiting to unload, so I enrolled in correspondence courses (this was in the ’50s) from Midland and Dana Colleges. A cousin, Thelma Gauger, taught me some words of shorthand, which came in handy for a journalist conducting an interview of newsmakers, so I sometimes practiced in the truck. Frenchman Valley Co-op elevator complex at Wauneta. Photo by Gary Rich. Wheat harvests come quickly and leave quickly on a march from Texas to Manitoba. If the wheat was dry we could easily go most of the night in the fields. Sometimes I would stretch out atop my “gold” (wheat) in the back of the truck, and look at the soft-friendly of the moon, looking at me and billions of stars. I marveled at the height of the elevators, not quite skyscraper high, but big nevertheless. They took a sample of wheat to make sure it wasn’t rotten. The price depended on the condition of the kernels. 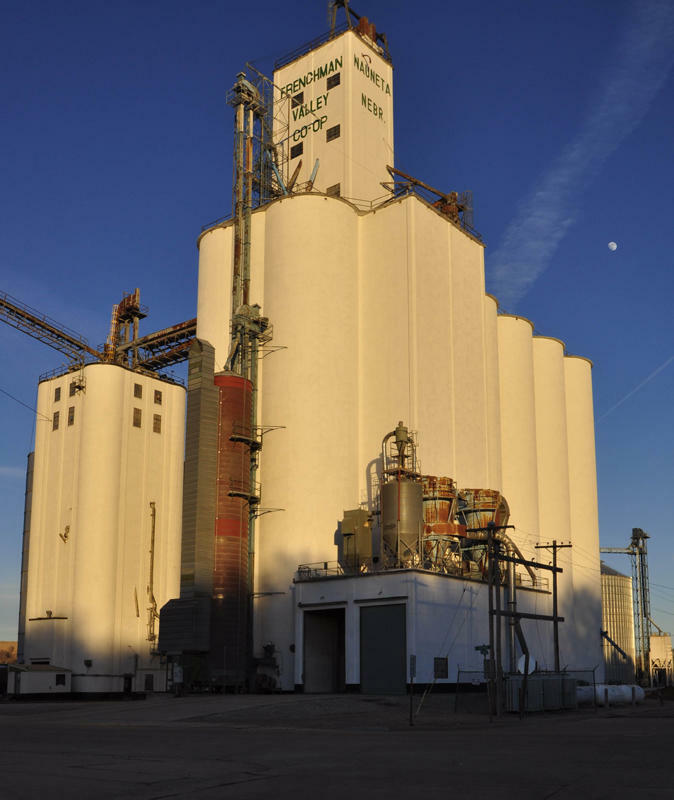 The first concrete elevator was constructed in the year 1941 at a cost of $27,700 by Roberts Construction Company with a 100,000-bushel storage capacity. This was the north section of the west elevator. 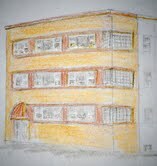 On March 12, 1945, it was voted by the Board to build a new office building. This was just west of the present building. Business was now increasing and also the need for additional storage. A second concrete elevator was built in 1948 as an annex to the south of the first, west elevator. This was built at a cost of $52,000 by Roberts Construction Company, increasing storage another 100,000 bushels. In 1949, the authorized capital stock was raised to $100,000. The steel building housing the wheat cleaner and feed storage was built in 1950 for $8,000. Continuing united efforts of management and membership saw another expansion necessary. 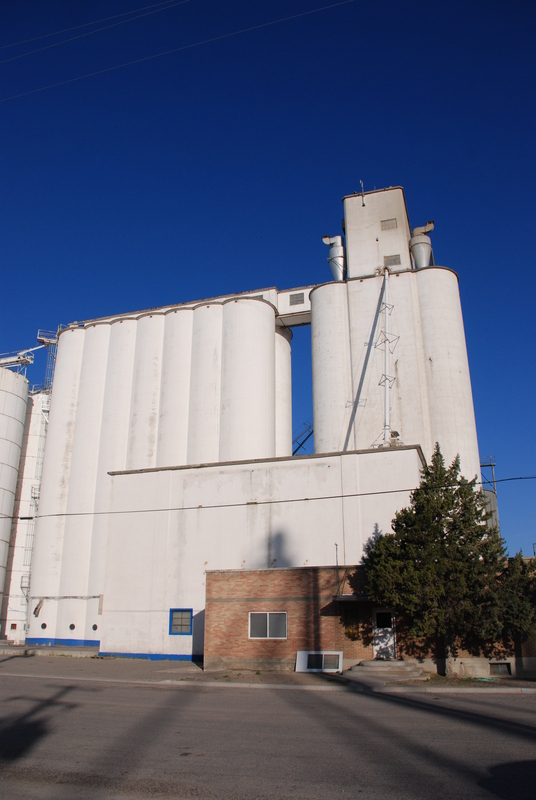 In 1954, following a vote of the stockholders, the contract was signed with Tillotson Construction Company for a new 250,000-bushel concrete elevator. This new one to be located to the east of the office at a cost of $138,971. In 1956 the Authorized Capital stock was raised from $100,000 to $600,000. So many elevators are in small towns that visiting one in a big city is a bracing experience. Tillotson’s Vinton Street elevator is at the bottom of a hill right in the midst of an Omaha residential neighborhood. The concrete silos stretch two whole blocks from Vinton on the north to Valley Street on the south. The southernmost of the annexes leans hard against Interstate 80’s westbound lane. To the east are bungalows and yards and gardens on the downslope from 32nd Street to 34th Street. And the resident of any of the houses to the west, going uphill from 35th Street, get a whole faceful of imposing grain elevator. One word stays in mind after my May 10 visit to Tillotson Construction Company’s Vinton Street elevator in Omaha: mighty. This elevator exudes mightiness. The headhouse soars to an exaggerated height, towering above the residential neighborhood and looking down upon Interstate 80, which is just 100 yards to the south. The delicately rounded corners present a contrast to the otherwise stalwartly rectilinear character of the tower. From the look of it, I wouldn’t have been surprised to learn there were offices up there: people tapping away at keyboards, making trades, issuing policies. It looks modern and well-designed and I can imagine how proud the Tillotsons were when they completed it. I don’t know what year this was built. During my first twenty-one years, which were spent in Omaha, I passed this elevator umpteen times without having any idea that my grandfather’s company had built it. 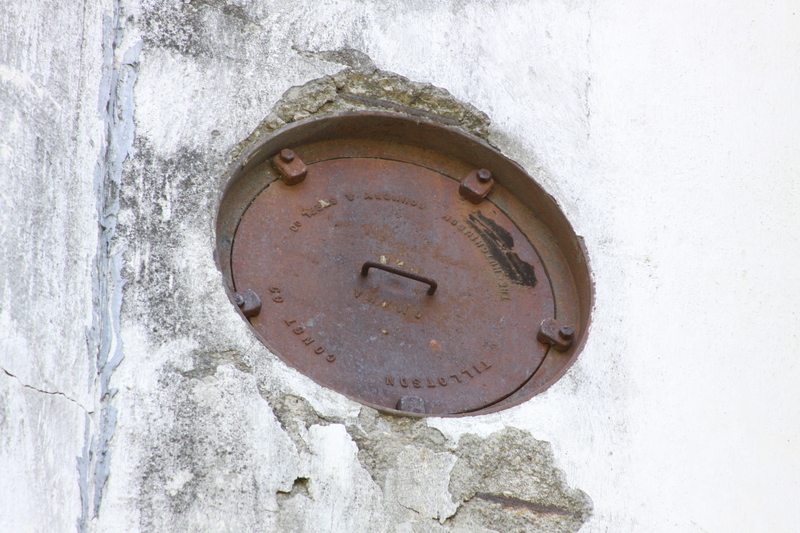 Now knowing what I do, finding the manhole covers with the company’s name was a thrill. Not knowing many other things, it would be interesting to learn the answer to questions about the elevator’s various fixtures and appurtenances. What is that big jobbie-do at the very top and when was it set there? Why are the windows located where they are? 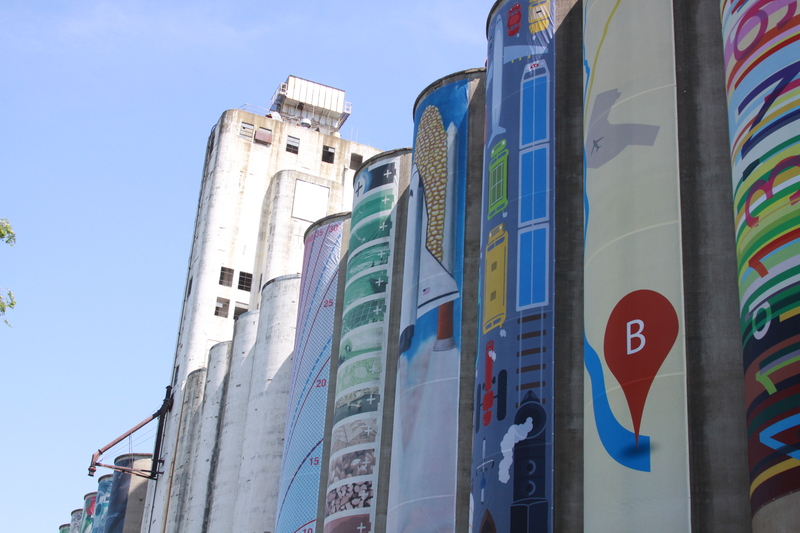 Of course the Vinton Street elevator has received national attention because the annexes have become the canvas for a public art project; the nonprofit organization Emerging Terrain has commissioned artists to create themed banners that have been draped over the silos, and in fact a crew was just finishing up the last hanging when I arrived. 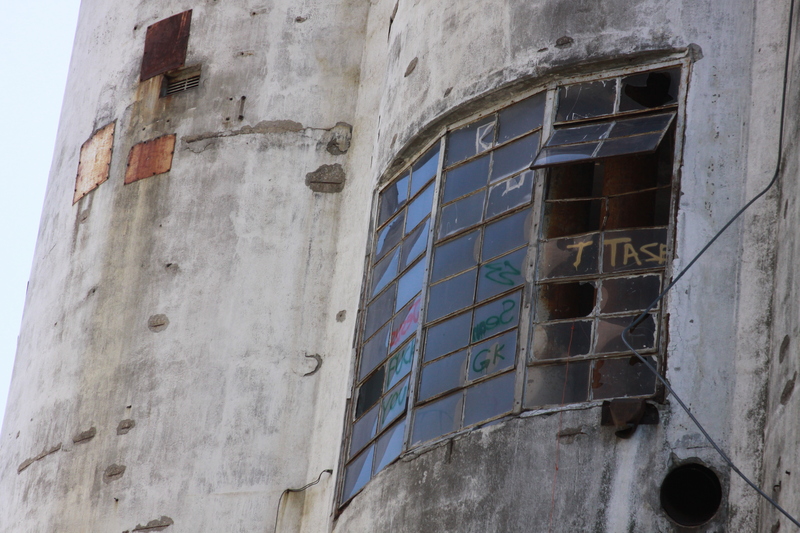 It’s a pity to see the elevator in disrepair, and I found myself wishing it would receive some attention, too. Oh, what a fresh coat of paint and new panes of glass would do for the appearance! On May 10, I was in Omaha with my camera. 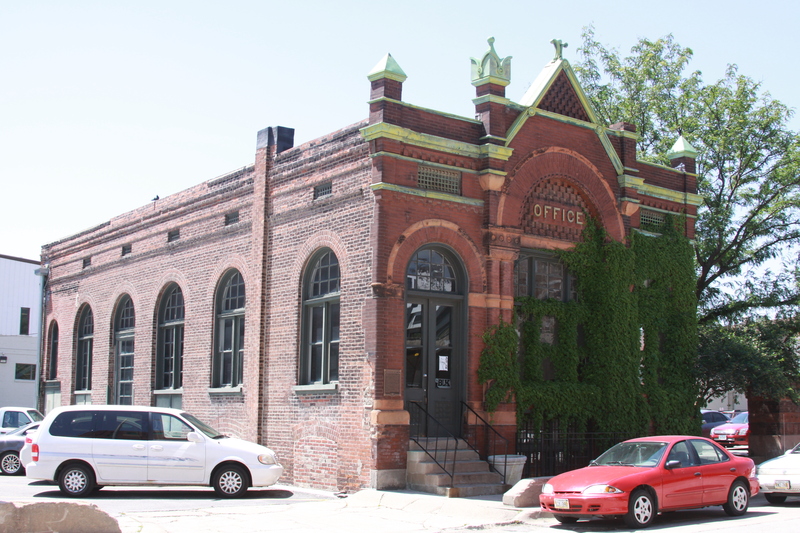 One objective was to visit the former office of Tillotson Construction Company. Uncle Tim Tillotson had recently tipped me off to this, saying he helped move out the company’s papers after Reginald’s death. “Twelfth and Jones–the Office, the OFFICE!” he said. I parked at 13th and Jones in the southern part of the Old Market area and walked across the intersection. In just a few more steps to the east I knew exactly what he was talking about. 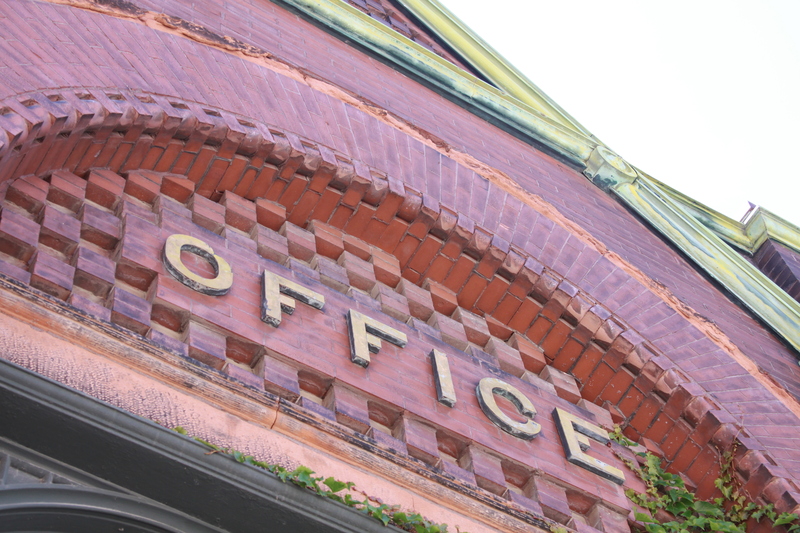 It turns out, the Office was part of an Anheuser-Busch plant of four buildings erected in 1887. Besides the Office, designed in Romanesque style, there was a bottling facility, a beer storage warehouse, and a stable. The other three buildings were torn down, but the Office survives. One hundred and one years after the Office went up, a finial above the doorway blew down during a windstorm. It was stolen and has never been recovered.